My family and I decided to dress up like Michael Jackson from different videos. 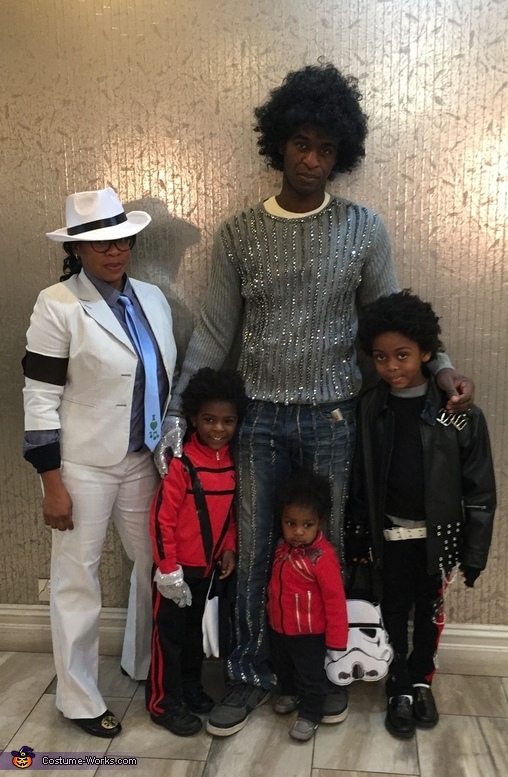 I (mommy) choose to be MJ from the "Smooth Criminall" video, my husband (Langston) chose to be MJ from the "Rock With You" video, my oldest son (Tristan, 6 years old) chose to be MJ from the "I'm BAD" video, my middle son (Avery, 3 year old) wanted to be MJ from the Thriller video and my youngest son (Quinn, 1 year old) was MJ from the "Beat It" video. I made the costumes using a leather jacket, sweat suits, a pinstripe suit, a pair of jeans & a sweater. I bought zippers, felt, belts and sparkly fabric which I cut and hot glued to create each costume.